Feral populations of Goffin's Cockatoos are common in urban parklands and gardens in Singapore. 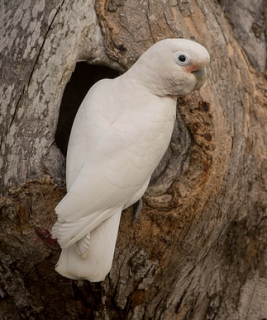 Both adults small white cockatoos, with white crest, white/blue eye ring, pink on lores, ear coverts yellow tinge, yellow under wings and tail, pinkish suffusion on breast and underparts. Bill grey/white. Eye brown/black in males, in female red. Loud scream. Young sound like Cockatiel (Nymphicus hollandicus), also produce mewing sound. Walk-in enclosure or cage, minimum length 3m (9.8 ft). Small seed mixture - canary, oats, safflower, limited sunflower; spray millet, sprouted beans/peas, corn, green foods: dandelion, lettuce, Swiss chard, sowthistle, chickweed; fresh vegetables and fruit; nuts (walnuts, hazelnuts, pecans, roasted peanuts), complete kibble. Are vigorous chewers so provide bird-safe, unsprayed fir, elder, pine or willow branches, wood toys (are chewers! ), vegetable tanned leather chewables, knotted toys for undoing, ladders, acrylic non-destructibles. Also provide overhead misters or shallow water bowls for bathing. Has been heavily traded in wild bird trade and has suffered from habitat loss. May also be trapped as crop pest. Tanimbar Islands, Indonesia; introduced in Singapore. Coastal lowland primary and secondary forest, cultivated areas. Other than some crops taken, little is known of their diet. Behaviour little known - may be vocal at night. In display birds strut, crest raised. 2 to 3, rounded eggs, 38.5 x 28.5mm (1.5 x 1.1 in).